Learning to grow tomatoes in cold climate. This is pretty straight forward. I usually plant tiny seeds into shallow container with good organic soil and keep them covered until they develop a pair of leaves. Then transplant them into bigger pots. In cold climates, you might need to transplant them twice as they grow, so they have space to grow and roots are strong and healthy. Fortunately, tomatoes are not too bothered by handling. They can take quite a lot. I would usually plant them in mid April, then transplant into ø12 cm pots when they develop “true” leaves, and start acclimatization end of May. Acclimatization process usually takes about a week with May’s heatwave. I’d start by taking them outside during the hottest part of day for an hour on the first day of acclimatization, increasing time spend outside by an hour every day until they can stand outside most of the day, provided the temperature is above 15°C. They should not be exposed to strong sunlight though. Southern location – hot, but shielded – is best. Big plastic storage boxes that can be covered are best for storing potted seedlings, as they are easy to clean, easy to take in and out and create the greenhouse environment that speeds up acclimatization. By the first week of June, my tomato younglings are usually acclimatized and ready for outdoor or greenhouse bed. This is a funny one. It really depends on the year. The summer of 2016 was hot here in Norway, so I’ve had lots of tomatoes without the greenhouse. 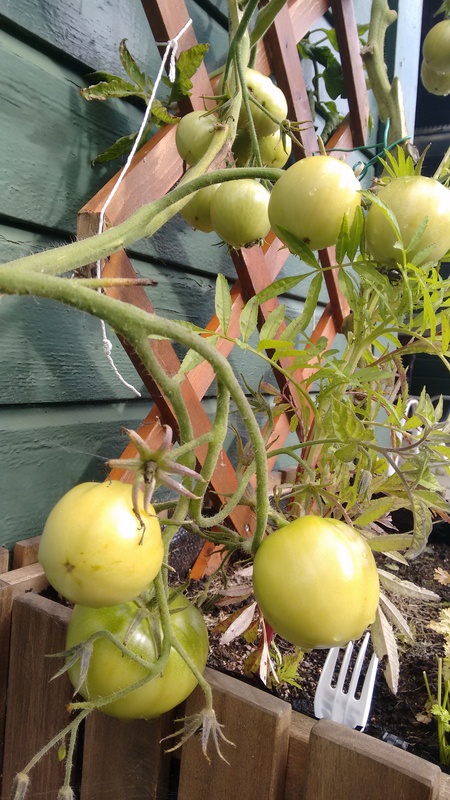 I just covered my bushes with light, white, garden fabric / row cover when night temperatures were below 15 C. However, I planted some tomato bushes outside the green house, in containers during cold summer of 2017 and the same kind of tomatoes produced very different fruit. The ones outside were fewer in quantity and very small – the size of plum tomato. While the ones inside the greenhouse has grown ridiculously big! Below are two images for comparison. 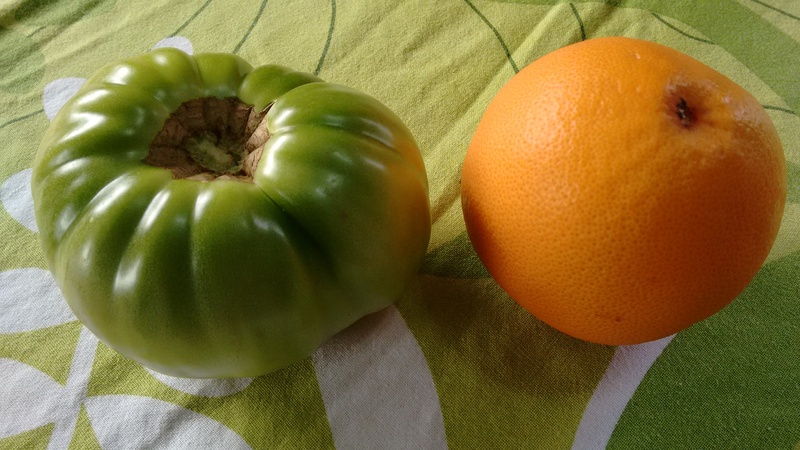 The greenhouse tomato that’s bigger than grapefruit and outdoor, container tomato that’s much smaller. You do need space! Especially root space if you grow undetermined height tomatoes. Undetermined means that the bush just keeps growing provided there’s space. Mine were 2.5 meters tall at some point! This type of tomatoes need to be planted in open soil or big raised bed. 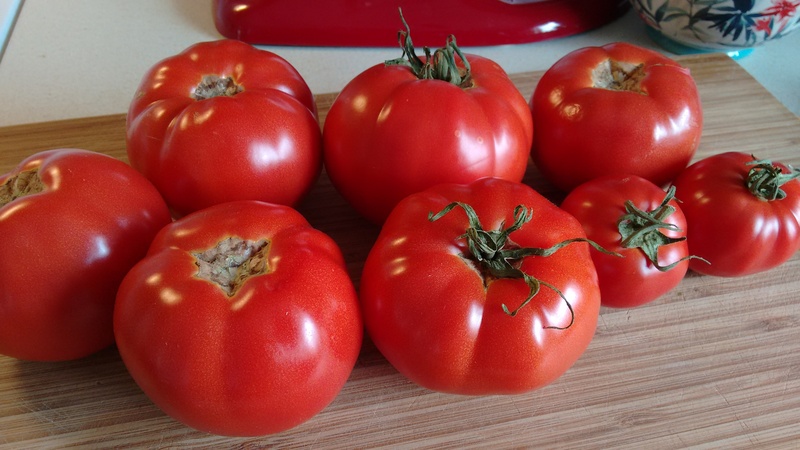 Containers are great for cherry and plum tomatoes or tomato sorts of determined size. Big heirloom tomatoes need deep root space for large harvest. I found tomato cages unnecessary. 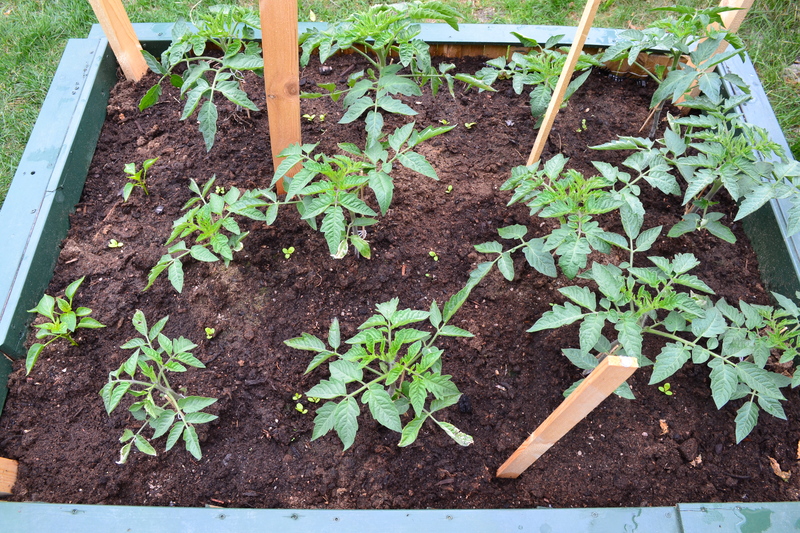 Sure, they provide support, but they also take space, so if you grow tomatoes in raised bed like I do, planted tightly, good old stake, driven deep into soil is better. Regular pruning of those giant bushy branches and suckers will also ensure lighter load. 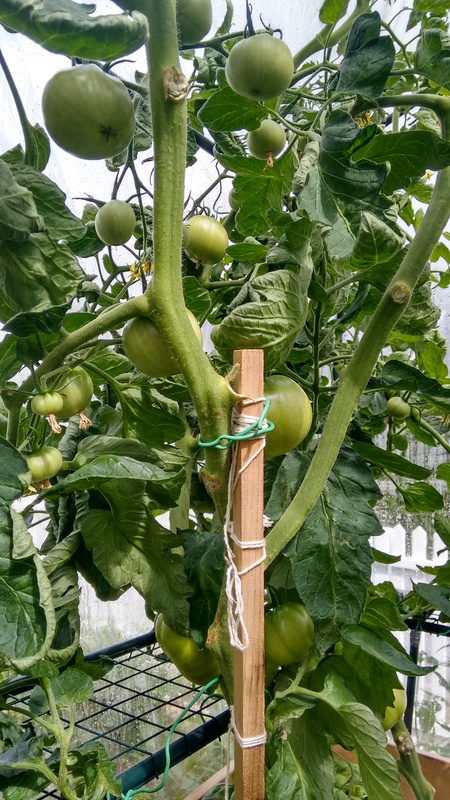 I usually end up with crowded jungle of tomatoes, tied to some makeshift poles with a thread. Very amateur indeed, but it works. Cow manure and magnesium salts are your friends. Everything else is unnecessary, provided you have a decent soil. I bought bags of organic soil for my tomato raised beds, so I didn’t have to build up soil from scratch. I’ve mixed 3 x 40 l bags of organic soil per 1 x 50 l bag of organic cow manure. Once tomatoes started to develop flowers and small fruit, I’d spray them with magnesium salt solution made of 2 tbsp of salts per 5 l water. I’d also recommend doing that if leaves start to turn yellow. If your raised bed is more than a year old, fertilize with composted chicken manure (pellets) once a month. If you have grass clippings from cutting the lawn, you can put them in a thin layer around each bush. Wait until it turns to straw, then add more fresh clippings on top, gradually building up natural mulch, that also feeds tomatoes nitrogen. Inside the greenhouse, I’d water every other day or every day if it is very hot. Outside, depends on the amount of rain. Important thing is to only water by the root – tomatoes hate to have water on leaves. Wet leaves and fruit also increases the chances of rot. For this reason it it also a good idea to have a proper ventilation in the greenhouse that can be closed on a cold night. Nothing works against slugs. Unless you befriend an army of hedgehogs. Nothing that is not bio hazard in any case. I’ve tried various salts, beer traps, food traps, raised bed borders, egg shells, tiny stones and sand, wood chips, grass clippings, you name it. What did help a little was planting some tender leaf lettuce to grow between tomato plants, so the buggers were busy chewing on those lettuces until I would pick them up during my morning or evening patrols. Lettuce seeds are usually very cheap and there’s plenty in the bag for you and the slugs. Hornworm caterpillar is a common tomato eater and can do a lot of damage if it gets unnoticed. The best thing to do is to check your tomatoes every day for the presence of pellet-like poop. Those worms do poop quite a lot, so it would be hard to miss. If you see it, start looking for them on nearby leaves and tomatoes. Pick them up by hand and drop in some container with water, where they will drown. Green ones are more difficult to spot than black ones, but not impossible since they grow quite big. After you pick them up, spray your tomatoes with water hose gently, washing off potential survivors and their poop. Yes, I wrote above that tomatoes do not like to be showered under normal circumstances, but those worms are worse than leaf curl. 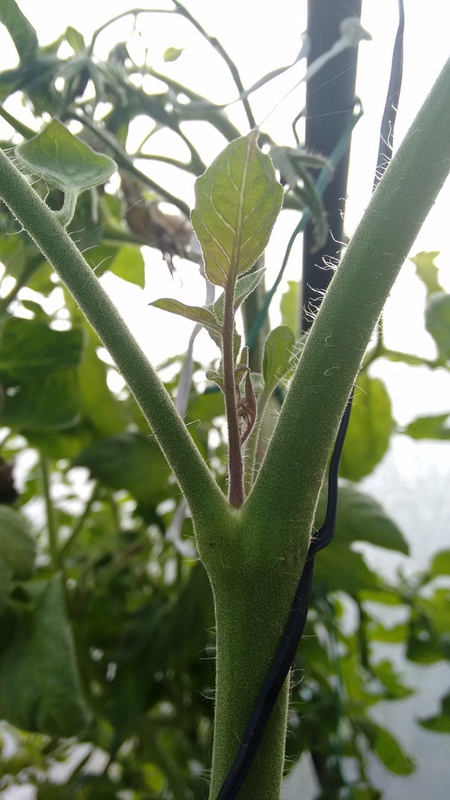 Pruning tomatoes are beneficial for the development of big healthy fruit and for tomato’s health. Too much moisture and soil on the leaves can cause disease, so get rid of any large branches that touch the ground. Don’t be afraid, just snap them out close to the main stem with hand or gardening scissors. So called “suckers” – new branches that develop between the main stem and any of the existing branches (see image below) – also need to be removed since they produce inferior fruit, but still need nutrients to grow and develop, so as soon as you see it – snap it out. If you grow tomatoes in cold climate, most of your fruits are unlikely to turn red while still on the vine. You have to pick them up while they are still green. Fully developed, but green. This way, you will have bigger and healthier harvest and don’t worry, your tomatoes will turn red. All you have to do is to wash them, dry, and place somewhere dark and dry for storage. Yes, DARK. 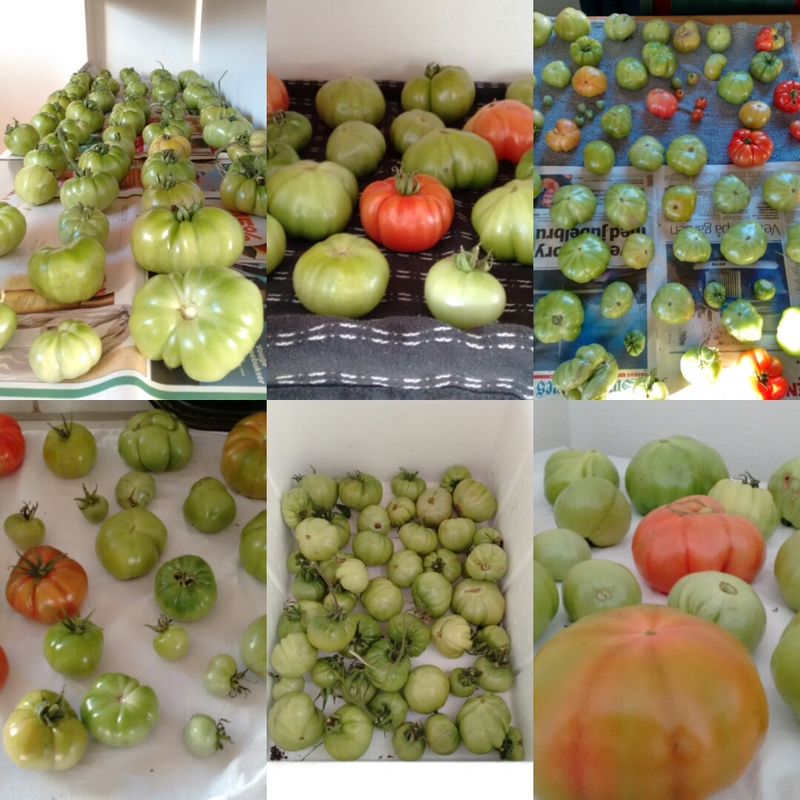 Tomatoes do not need sunlight for ripening, lycopene develops in dark, but warm environment. In fact many commercial tomato growers keep their greenhouses completely dark once the fruit develops, to speed up the ripening process. I stash my harvest all over the dark kitchen corners: top of the fridge, under the kitchen isle, inside cupboards if there’s space. Important thing is not to pile them up in order to avoid rot and check them regularly. How to determine the fruit is ready? Size is the first clue. Some of my tomatoes needed to be picked up because they were breaking the vine, dooming those not yet fully grown tomatoes to certain death. Other sign is a hint of colour. As soon as you see it, pick it up. Let other tomatoes to grow further and save the blushing beauty from pests and cold autumn nights. It takes anything from a couple of days to two weeks for tomatoes to fully ripen, but they will! Just check out these beauties! Good luck!